What if this was the year your church multiplied? Rather than putting it off until some future date, what would happen if your team leaned in and made the decision to do it this year? You’re going to have to start before you feel ready. So … you don’t feel ready? Perfect! Today’s the day to start. Here are some reasons I think this is the year for your church to launch a new campus — your first, your fourth or your fourteenth. Your community needs it // 94% of churches are losing ground against the population growth of their communities. In 2050, the percentage of the US population attending church will be half of what it was in 1990. [ref] Go back and re-read that. If God has blessed your church with bucking that trend, you owe it to the broader Kingdom to multiply what is happening in your church with new locations. Time is short and multisite represents the most effective way to reach people in our communities. Is it a lot of work? Sure. Is it going to demand a lot of your leadership? Definitely. Is it easier to stay where you are today? Of course. But your community needs the Good News you present. There is no better way to release new leaders // There are people in your church who are called to lead but your structure limits their ability to do so. There are simply not enough available roles for them. 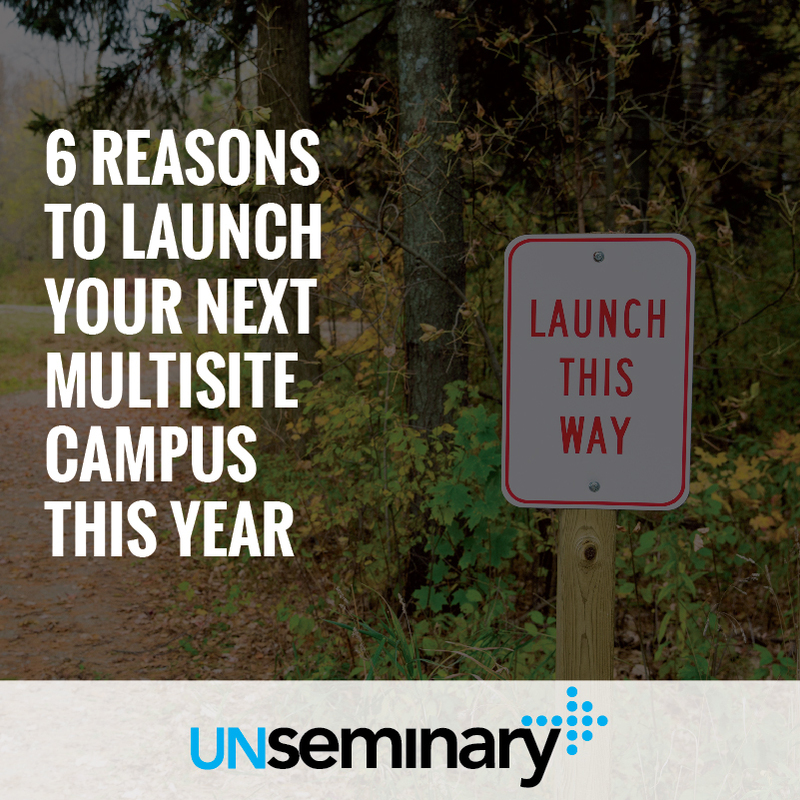 Launching campuses is a sure way to increase your “need” for new leaders. In turn, it creates all kinds of new opportunities for people. Nearly 90% of multisite churches surveyed found increased volunteer participation with the launch of new campuses. [ref] There was a need … and they had to fill it. More leaders were released and the churches became stronger. You’re not a mega church // Stop waiting for that “mega church” across town to do it. 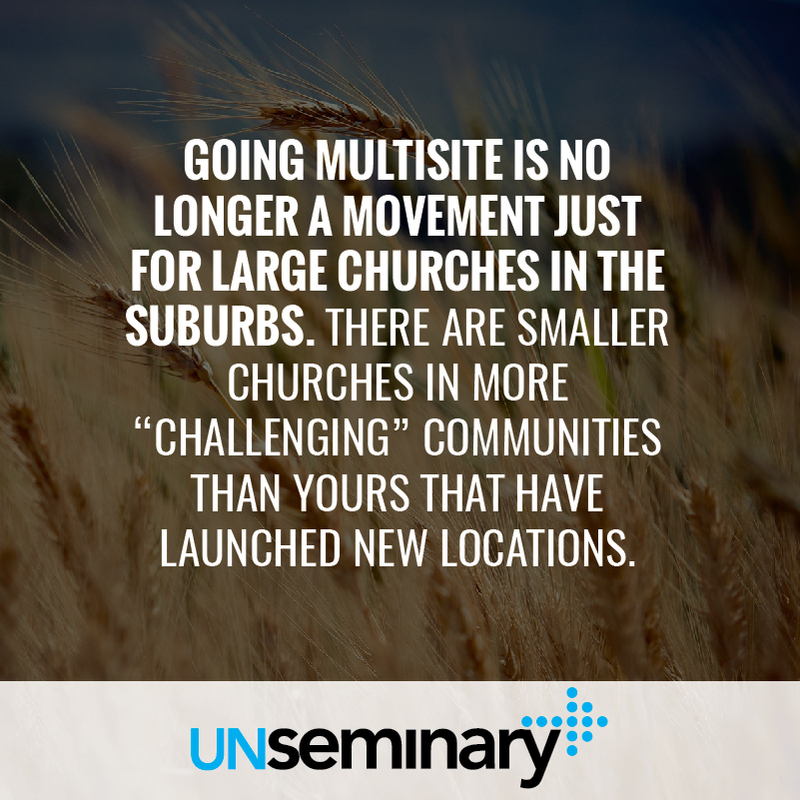 According to Leadership Network studies on the multisite church movement, the average size of a church that “goes multisite” keeps getting smaller as the movement continues. [ref] In 2005, I was leading in a church of 3,500 and was invited to join a panel discussion about multisite. They referred to our church as an example of how multisite works in a “small church”! The movement has come a long way in the last 10+ years. Churches of just a few hundred are spinning off viable campuses that are making an impact. It’s no longer a movement just for large churches in the suburbs. There are smaller churches in more “challenging” communities than yours that have launched new locations. Service provider ecosystem // You don’t have to do it all alone. There is a mature ecosystem of companies, service providers, consultants and products designed to help your church go multisite. They are ready to jump in with various pieces of the puzzle to help your church make this leap. Don’t overlook this … these providers are working with hundreds (maybe thousands) of other churches like yours and can provide support as you take this step. Locations // Regal Theatre Church provides full-service coaching to help you find locations in your target communities. Gear // Portable Church Industries can build a system that meets your needs in the new location. They have everything from baby gates to huge audio/video rigs that can all be set up quickly so you don’t burn out your volunteers. Database // Managing people in multiple locations requires a database that is built with multisite in mind. Church Community Builder is an effective tool for managing the “people” issues related to going multisite. Staffing // Finding the right Campus Pastor can be a challenge … the folks at Vanderblomen Search Group have helped dozens of churches acquire great team members to make multisite work. Funding // INJOY Stewardship Solutions works with churches to raise the financial support needed to go multisite. You need to risk again // Stagnant leaders don’t take risks. They surround themselves with other leaders who are risk adverse. Under the guise of “good stewardship,” they are careful not to do anything that gets close to being a risk. They are comforted by spreadsheet projections that predict next year looking basically the same as last year. 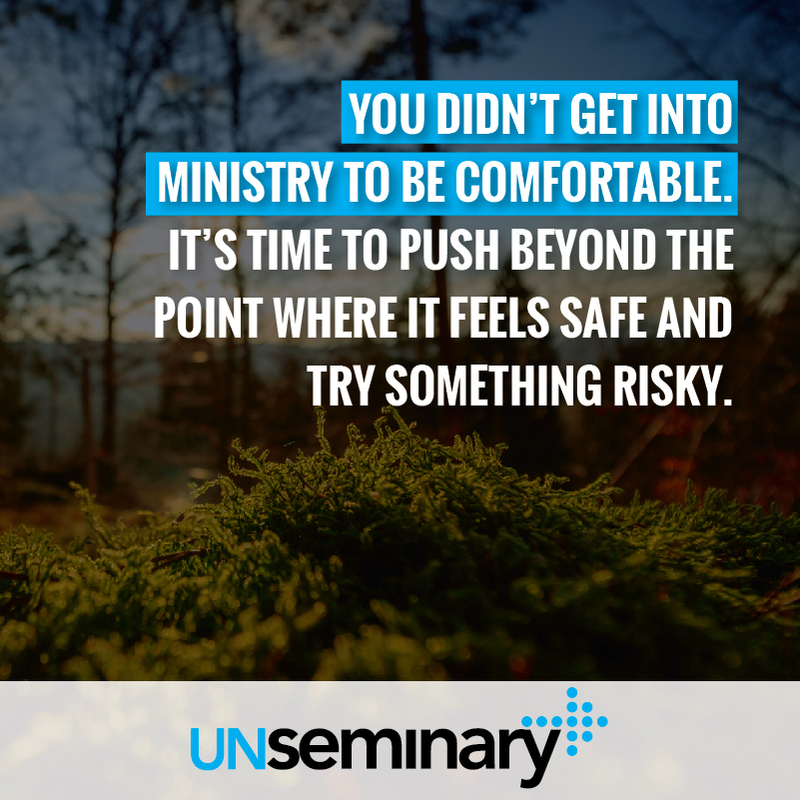 But you didn’t get into ministry to be comfortable. Impact isn’t found inside your comfort zone. It’s time to push beyond the point where it feels safe and try something risky. Launching a campus in the next 12 months could be that risk. Nothing reaches new people like new campuses // The most recent exhaustive study of multisite by the Leadership Network sparked a lot of discussion about multisite campuses reaching new Christ followers at a faster rate than any other initiative. [ref] It asked churches who have done both “church planting” and multisite to weigh in on the comparative effectiveness. Church planting has long been seen as the most effective way to reach new people with the message of Jesus. But this study shows that churches who do both church planting and multisite are seeing more people make decisions to follow Christ in their new campuses rather than new church plants. Don’t miss this. If you want to see people in your community reached this year … launching a new campus is the most effective way to do it. Who could be the campus pastor? // People follow people … get this right and your launch will be strong. Where could we meet on Sundays? // Choose your location far enough away to reach new people … but close enough to “hive” off a healthy launch team. How can we build a system for finding leaders and volunteers? // You need a lot more volunteers than the “early adopters” who will jump in at first. Why do people tell their friends to check out our church? How do we replicate that? // The new campus needs more of what people love about your church. What will the funding model look like? // Be clear up front about how the new venture is funded and what happens to offerings collected in the new location. Why are we doing this? // Boil down the vision and make it sticky. It’s about reaching new people, not making church more convenient. Put that in your own words.